The main cause of toenail fungus or onychomycosis is poor hygiene practices such as sharing of personal items like socks or shoes. Knowing what causes toenail fungus is essential to prevention. While molds and yeasts can be responsible for a toenail fungus infection, it is thought that 90% of toenail infections are caused by a type of fungi called a Dermatophyte. These little buggers are not easy to eradicate, but fortunately, with laser toenail fungus removal they have finally met their match. It is important to educate yourself on the causes of toenail fungus infections because after your treatment, you will still be able to become re-infected. 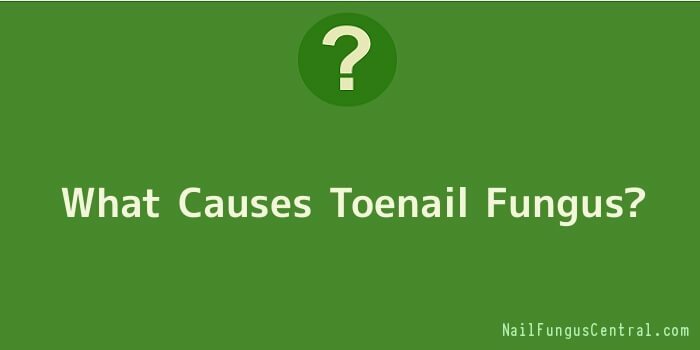 It sounds obvious, but if more people realized what causes toenail fungus they wouldn’t get it. Sharing personal items such as shoes or socks is among the leading causes of fungal toenail infection. It is actually very contagious, but it does however require a warm, moist environment to be present to be able to take hold. They live in warm moist environments such as showers or swimming pools and are able to penetrate your body through microscopic cuts or abrasions that are not even visible to the naked eye. The toenails are far more often affected by fungal infections than fingernails for 2 primary reasons. Firstly, toenails are more often subjected to the warm, moist environment fungi need to thrive inside your shoes and socks. Second, lessened blood circulation to the toes in comparison with the fingers, hindering your immune system and make it harder for your body to detect and ward off an infections. Poor circulation is commonly worsened by wearing shoelaces too tightly as well as socks that do not permit proper ventilation. People, whose nails grow at a slower rate, are considerably more likely to experience toenail fungus infections. The reason for this is that the bed of the nail is exposed for a much longer time period than in people whose toenails grow at a faster rate. Older people are more at risk for toenail infections due to their weakened immune system. People affected by diseases that compromise the immune system such as HIV/AIDS and diabetes. People with autoimmune diseases often must take immunosuppressive drugs, which in turn weakens their body’s immune system making them more susceptible to fungal infections.